Note: 1.There maybe 1-2 cm deviation in different sizes, locations and stretch of fabrics. Size chart is for reference only, there may be a little difference with what you get. This adorable dress features cap sleeves, pullover style, maxi full skirt and banded neckline. 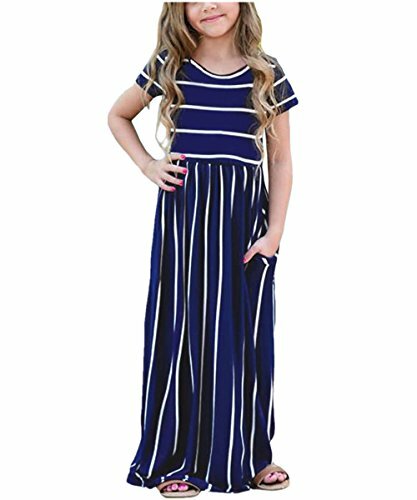 Crew neck, solid color, short sleeve style with pockets and cinched waist, maxi long dress. Occasion:wearing as casual playwear dress,school dress,holiday wearing,travel wearing, wedding, formal dress etc. Bag contains：1*Striped Color Block Holiday Beach Long Dress.No included blet and flower. If you have any questions about this product by KIDVOVOU, contact us by completing and submitting the form below. If you are looking for a specif part number, please include it with your message.